We've written previously about our first impressions with the Meccanoid robot so you might want to start there. Now we're going to look at the motion capture feature of the Meccanoid app. Note that we've got the smaller Meccanoid G15. The larger Meccanoid G15KS has the same functionality but a wider range of movement. Update: This feature has now been replaced by a drag and drop coding behavior builder which works with Meccanoid 2.0 and G15 models. 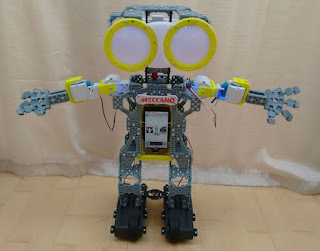 SpinMaster Meccano suggest that you run the app on a phone which is placed inside the Meccanoid. There's a compartment on the front of the robot to hold the phone. I guess this way of doing things does make recording movements feel more like an interaction with the robot. We've tried this approach with an Android phone, but we also found that that the app works on a tablet in a desktop stand. There's no particular need to put the device inside the Meccanoid which might be useful for kids who have a tablet but not a smartphone. What Does Motion Capture Do? Meccanoid motion capture uses the camera of a smart device to detect the movement of a human (Kinect style.) You can record movement on your device and then play it to have Meccanoid copy your movements. You can save sequences of movement so you can replay them when you want. Note that Motion Capture only allows you to control Meccanoids arms (and head for the G15KS), not movement of the feet. You need to have your Meccanoid connected via bluetooth to use Motion Capture. I'm not sure why this is necessary as you can see the onscreen avatar. It would be good to have this feature in offline mode so that you can save the battery on the G15 particularly. Once you have connected your Meccanoid via bluetooth the motion capture icon lights up and is available. Choose the icon with the person standing next to Meccanoid. This is the motion capture feature. Note that despite what the icon suggests, Meccanoid's movement is mirror image. When using a phone in the compartment then Meccanoid copies (mirrors) a person in front of it. 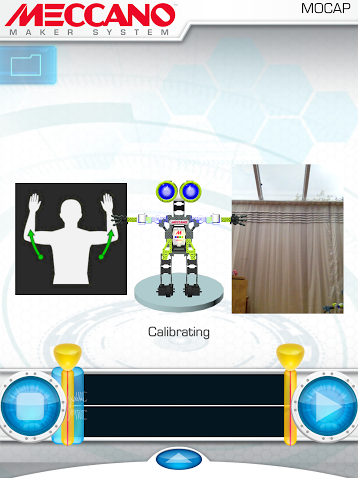 The app shows you how to stand and will try and calibrate. The app will warn if you are standing too close or need to move to the side, or if there's an issue with the lighting. We've had a mixed experience with this process so far. We've found that most of the time the app tracks immediately with an adult if the lighting and distance are okay. It seems harder to get working with a young child though we've had some success. Sometimes it works well whilst actually showing the Too Close warning. If it's not managing to track then try changing the lighting conditions and adjusting the distance from the person being tracked to the device. When it has calibrated it does a countdown and then starts recording. You can pause and restart your animation and there's a timeline slider for moving to a specific point in an animation. Here's a quick video showing the feature in action on an iPad. We found that the actual motion capture works very well on the iPad as long as you don't try and move too quickly. The app is designed to work in portrait mode which makes it a bit tricky to get your arms in view when holding them out to the side. It doesn't need your hands though - the Meccanoid doesn't have motors there. We've found that sometimes the tracking stops without triggering recalibration and we have to exit the app and restart. We've tried the Android app on an HTC One which just squeezes into the phone compartment. It's a big phone, but not the biggest, most phones should be okay. Motion capture worked pretty well on our Android phone and the interface is pretty much the same as on iOS. Tip: Don't forget to connect to Bluetooth before putting the phone in the compartment - the Meccanoid button that you need to press to okay the connection is behind the phone once it's in place. We found that we couldn't leave motion capture running for long on the phone because the app said we'd reached the maximum animation length. It would be nice to just be able to use motion capture live without recording it. It's fun to have Meccanoid copy a kid's actions without recording it. It's hard to see what's going on once the tablet is in Meccanoid's compartment so we'd recommend trying motion capture without putting the phone into Meccanoid first of all. Some spoken help would be a useful feature here. You can just tap the folder icon to save animations that you have created so that you can play them or edit them later. You can't add voice or LED colour changes during motion capture. But if you save a motion captured animation then you can load that into the Ragdoll Avatar editor to add further behaviours. This is an excellent feature. More on Ragdoll Avatar animation in a future post. Motion capture is a neat feature. I'm not sure how practical it is for capturing accurate movements to replay. It's better and recognising movement in the x and y directions - the z direction is obviously harder. It's definitely clever and fun though. It's the kind of thing that kids are going to want to demo to every visitor that comes to the house. The Meccanoid App is available for iOS: US | UK and also for Android on Google Play. The Motion Capture feature has been discontinued in the current version of the app. In its place is a drag and drop programming environment for all four of the bigger robots. Maddeningly they have not released any proper "manual" or help file - just a few "tips", but it does look promising (it has conditionals and loops). This should allow for more "open-ended" programming of the robot than the previous app offered. Hopefully some proper documentation will arrive in time for Christmas. Unlike the previous version of the app, you will need to set up an account with SpinMaster and it does ask your age (I'm not sure why). Thanks Steve. I've started looking at the Behaviour Builder and will put a new post up soon. There's quite a bit of documentation in the app but what you really need when getting started is examples, as you say, hopefully more help is on the way. Having to create an account before you can do anything is a bit frustrating as it makes it slower to get started, the age info will be because they need parental permission to store info about under 13s. The need to redo the tutorial on every device you install the app on is a bit annoying too. But it does look like the Behaviour Builder has a lot of the capability that we've been waiting for to turn Meccanoid into a real programmable robot platform.